I have no idea what I was searching for when I found this recipe, but boy, I’m glad I did. I believe I was looking for a vegetable side dish to serve with tacos, and somehow I got to this. Hey, it has vegetables in it, and the end product is green. That has to count for something, right? Irregardless, this dish is delicious (I wanted to hoard the rice and ditch the rest of my dinner), easy to prepare, and if you time your cooking right, it doesn’t take a whole lot of extra effort to make. You can also use this rice as part of a burrito (it’s wonderful with chicken and sautéed onions and peppers for a fajita burrito), or simply as a side for grilled chicken or fish. Or you can just inhale the entire bowl. Yes, it really is that good. In a medium saucepan, bring chicken stock and poblanos to a boil over medium high heat. Partially cover and gently simmer for 10 minutes. Add cilantro and blend with an immersion blender (or use a regular blender or food processor). Pour mixture into a liquid measuring cup or bowl. Wipe out pan and heat the oil. Add the onion and rice. Cook, stirring frequently, until the rice grains resemble the color of white chalk. Add garlic and cook until fragrant, about a minute. 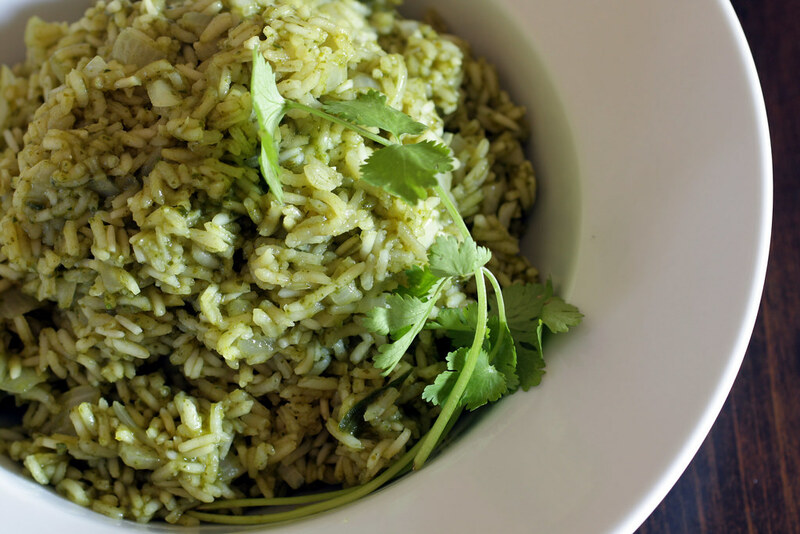 Add the green sauce to the rice, stir and scrape down any grains of rice clinging to the side of the pan. Cover and reduce the heat to medium-low for 15 minutes. Check the rice – it should have just a little bite left in the center. If it does, remove the rice from the heat and let stand 5-10 minutes. If the rice seems really underdone, cook for another 5 minutes, then let stand. Fluff with a fork and serve, garnishing with cilantro if desired. I could not get further than “Irrigardless”. That is not a word and I can’t trust a recipe from someone who uses it. It is a word however it is spelled irregardles and not being a snob I will probably try this recipe. The correct form is “regardless”–putting the “ir” in front makes it a double negative, which makes the statement the opposite of what you mean. Regardless, there is nothing that will stop me from making this recipe, with much thanks to originator.